After arming Grak and Ora-Tok (or just "Tok" as they called him) with some swords, the ventured to the end of the hall and opened doors that led into a large chamber beneath the keep's courtyard, open to the moonlight above through a thick, iron grate. In the middle of the room was a stinking heap of sludge with the odd bone jutting up through its surface—this was the killing chamber for the victim's of Cauldron Keep. Not wanting to waste any time with the keep's occupants on alert, the party double backed to where the captain had escaped and Grabby eventually managed to pick the lock. They descended down some stairs to the next level that led into a long corridor. They moved down the hall, passed three doors, and entered a large room at the end of the hall. Inside was a grisly laboratory lined with shelves of books, a broken and desecrated statue of St. Eliah, and several wooden tables with various body parts, gore, and the mutilated remains of several mongrel folk—this obviously upset Tok. After a brief look through the lab, the group continued out of the room and down a set of stairs that descended into darkness. Grak informed the party that it was about a twenty minute walk down the stairs. So the party descended, with Ander far in the lead to scout ahead. Eventually the stone walls and stairs gave way to rough cavern walls and crudely carved steps, and a faint green glow could be seen further down. When the party made it to the bottom of the stairs they looked upon a scene which none (except maybe Broak) had ever seen: a vast underground wilderness with various mushrooms of all sizes, mysterious incandescent foliage casting the dull green glow, air filled with glowing motes, and the sound of flowing water. The ceiling of the cavern was high enough to be obscured by darkness, with the occasional stalactite jutting out from the blackness. Following Tok's advice (with Grak objecting, stating it was most likely a trap), the party headed off to the right of the vast cavern, as Grak seemed to imply it was the safest path and they could take refuge in his peoples' subterranean village. As they made their way through fungus and moss laden cave, the sound of human voices could be heard up ahead and the party stumbled into a patrol of more guards. —greatest battle of all time!! 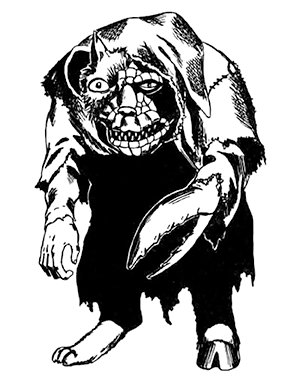 During the battle, Grak and Tok and stayed at the rear, when the dust had settled the party returned to find Tok seriously wounded—attacked by Grak—and Grak the bugbear nowhere to be seen. The party carried on through the caverns directed by Tok, following a stream, passing through a dense fungal forest with a central lake. Eventually he led them to secret passageway in the rock that led to his village. The cavern opened into a grand chamber, with large, natural stone steps circulating around the cave, with hollows and openings filled with various wares—the hovels of the mongrel folk. In the centre of the chamber was the grisly remains of the village: a large pile of mongrel folk bodies, charred black. As a distraught Tok surveyed the destruction of his village, two more mongrel folk came out from hiding—Mogg and Skogg. The two survivors recounted the events to Tok and the party, a group of men in robes accompanied by a group of bugbears attacke dthe village, killing everyone and taking a few prisoners away with them. Skogg, the villages greatest warrior told the party that there was a shortcut through a collapsed cave that the party could navigate their way through to get to a ruin where the raiders seem to be stationed.